Altitude Snacks was born in Steamboat Springs, CO and embodies the simple, healthy, active lifestyle you’d expect from this iconic Rocky Mountain town. 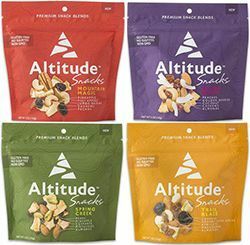 Altitude Snacks uses premium ingredients for all their dried fruit and nut blends and they are committed to bringing you a nutritious snack that is free of sulfites, preservatives and added sugars. Whatever life throws at you, let Altitude Snacks fuel you to new heights. And Free Shipping to boot! Alpen Glow contains Roasted Cashews (Cashews, Sunflower Oil, Sea Salt), Raw Almonds, Coconut, Dried Peaches, Dried Golden Berries. No Sulfites. Mountain Magic contains Jumbo Raisins, Roasted Cashews (Cashews, Sunflower Oil, Sea Salt, Black Pepper), Dried Pineapple, Dried Sweet Apples, Raw Pecans. No sulfites. Spring Creek contains Dried Pears, Roasted Almonds (Almonds, Sea Salt), Currants, Dried Pineapple, Roasted Pistachios (Pistachios, Sea Salt). No Sulfites. Trail Blaze containsDried Apricots (Apricots, Rice Flour), Roasted Almonds (Almonds, Sea Salt), Dried Cherries, Dried Tart Apples, Roasted Macadamia Nuts (Macadamia Nuts, Sea Salt). No sulfites.